Six months ago, commodities looked like they were on the brink of a comeback. The S&P GSCI Total Return gained 7.4% YTD through June 20 at its high. Back then, almost a record number of commodities, 12, were in backwardation, reflecting shortages in Brent Crude, Cocoa, Copper, Corn, Cotton, WTI Crude Oil, Feeder Cattle, Gold, Live Cattle, Natural Gas, Soybeans and Unleaded Gasoline. Now, the S&P GSCI TR has lost 1/3 of its value, mostly coming from oil since taken together WTI and Brent make up about 40% of the index with a total of 62% in the energy sector. Energy is down 42.8% from its high in June, and at first it seemed the other sectors were sliding with it. Notice in the table below that in the S&P GSCI TR, all the sectors posted losses from June 20 through most of the summer, with precious metals ending its losing streak just in November. Source: S&P Dow Jones Indices LLC. All information presented prior to the index launch date is back-tested. Back-tested performance is not actual performance, but is hypothetical. The back-test calculations are based on the same methodology that was in effect when the index was officially launched. Past performance is not a guarantee of future results. Please see the Performance Disclosure at http://www.spindices.com/regulatory-affairs-disclaimers/ for more information regarding the inherent limitations associated with back-tested performance. At some point the oil price slide decoupled from the other commodities since their fundamentals are different. From their respective bottoms, agriculture gained 11.8%, precious metals gained 7.3%, livestock gained 6.0% and industrials metals have been flat, gaining 60 basis points. Nothing is overpowering Saudi’s oil supply in energy, but now energy seems to be on its own. Below is the graph of the sector performance where energy’s lonely dropoff is clear. What’s changing? I have mentioned that low inventories are causing mean reversion that is likely to drive swings between winners and losers. These swings also show up in flipping term structures. 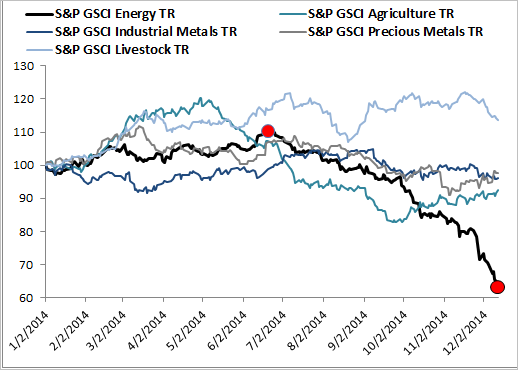 Over the summer through October the number of commodities that remained in backwardation dropped from 12 down to 4. Only WTI, Unleaded Gasoline, Copper and Feeder Cattle remained in backwardation. Today, WTI Crude Oil and Unleaded Gasoline have succumbed to the supply glut of oil so these commodities have lost their backwardated positions and are now in contango. However, now, in December, the number of commodities that are in backwardation is TEN with six newly flipped commodities! This group includes Feeder Cattle, Heating Oil, Copper, Corn, Cocoa, Silver, Kansas Wheat, Lean Hogs, Coffee and Live Cattle. News of hoarding from Vietnam of coffee, Russia with wheat and an export tax from India on sugar are supply issues that may be supporting this term structure.